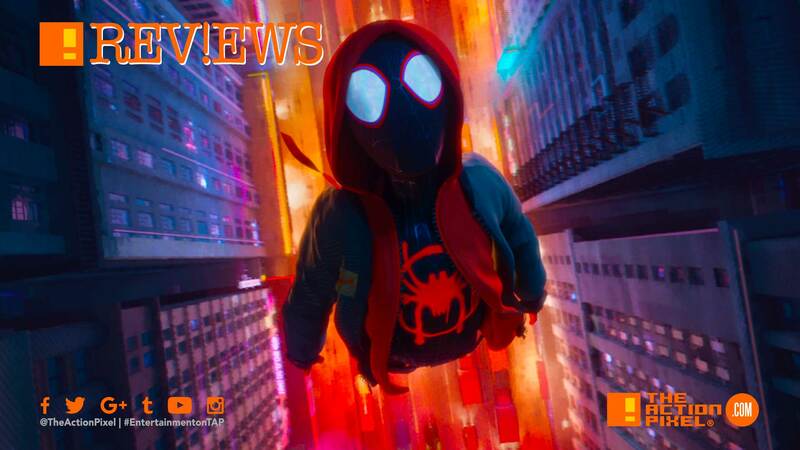 #TAPReviews | "Spider-Man: Into The Spider-Verse"
The Spidey mantle is passed. But how does Miles Morales measure up in Sony’s Marvel Universe? Sony Picture’s attempt at creating a Marvel-esque cinematic universe has had a few hits and misses in the recent past, and after Spider-Man found his way home on loan in Marvel’s Captain America: Civil War, Spider-Man: Homecoming, Avengers: Infinity War and the coming Far From Home film, Sony has begun the work of taking a bit more responsibility for their awesome slice of the Marvel Universe. Venom, the first of a few films lined up to kickstart the Spider-Man universe at Sony/Marvel, came and did well in the box office. Of course, it was a “first”, but by no means was it a memorable thing. So now the second attempt comes to cinemas with an animated film – Spider-Man: Into The Spider-Verse. It is not lost on me the general views of animated films and their appeal to the masses so long as they fit into the Pixar-esque, ‘clean’ 3D cookie-cutter formula. So going in, there was some apprehension. But then there was the trailer. A trailer that teased lithe animation, stylised images that were a throwback to the comic book’s Ben-Day dot aesthetic. Which all admittedly got me interested. I also started making bold claims off the strength of that trailer that Spider-Verse would be the true, successful nexus film, ultimately proving to be the best direction for Sony Pictures to take going forward with their Spider-Man Universe. So, in a way, it was both our and Sony Pictures’ time to show and prove. So let’s get with the ‘thwip – release’ flow of things, shall we? Miles Morales is the cool kid everyone wishes they were. Bit of an artist with an affinity for tagging. Does not know every lyric to his favorite song but hums along earnestly anyway and hits almost all notes offkey. Popular, fun and a nerd. Miles, however, is going through a new transition to a new school. Plus having a dad that’s a cop can seem like way too much authority in one parent. Miles soon finds his new school and keeping up with classes and his parents’ expectations daunting and soon find solace at his Uncle Aaron’s place, who is a little less on the straight and narrow of his brother – Miles’ cop dad. And this is where kismet takes its hold on Miles life. Mile’s Uncle takes him into a clandestine part of the subway to graffiti bomb a wall with some therapeutic art. This particular tunnel however is also home an Alchemax spider and some toxic Alchemax dump. The spider admittedly takes its sweet time biting Morales on the hand. A moment that is made to ultimately look greater than the nonchalant reaction of Miles. Soon things start to get… weird. Not just the discovering of his new abilities and things sticking to his hands and that he could traverse walls. Earthquakes ripple across NY, but these are not natural and in their wake objects become distorted due to space-time continuum warping. And the King-Pin is at the centre of it, building a Hadron-esque collider that is used to create the god particle paramount to opening a portal between universes. What makes matters worse in inspecting his own dilemma, Miles gets caught up in a battle between his universe’s Spider-Man and Scorpion, whose about the most terrifying version of the character we’ve seen save for the Spider-Man PS4 game. Spidey of course manages to get Miles out of harms way and both their Spidey senses kick in like clashing cellphone signals. This brotherly chance meeting however, gets cut violently short when Miles witnesses the death of the Peter Parker Spider-Man of his universe (who happens to be blond) at the hands of the King-Pin. Miles is now on the run from Fisk’s goon the Prowler (who’s terrifying when you think the sound you generate sounds like autotuned screaming). Charged with the promise made to a dying hero to take a device that would ensure the collider would become forever inoperable and save New York, Miles will come to understand that becoming a hero does not come with the power, but with a decision. And with the timeline and universes all out of whack, there are more than a few Spider-Men (and women) invading Miles Morales. Comedy is universal but can’t be pinned down by some formulaic certainty. It is important to take note that Spider-Verse humour is, to an extent, self-aware; The first Peter Parker makes reference to Sony’s Spider-Man trilogy in a series of Flashbacks retelling the journey of the neighbourhood Spidey. Even that scene no one wants to talk about from Spider-Man 3. You know the one – with the emo dancing. Abysmal. But the humour, thankfully goes way beyond that. The stand out is the scene where Peter Parker and Miles Morales steals a hard drive from Dr Octavia’s laboratory with important information regarding the collider. Peter battling her to reuniting with Miles in the most violent way but plays it off like it was nothing. Telling Miles that it is good he got the hard drive but the monitor is not needed. Of course, me writing this out is not giving it near the amount of justice it deserves. Timing is key for everything. Especially as it relates to comedy. And it seems Spider-Verse got this down pat. Maybe because, like all animations, ideas are exhausted through animatics and storyboards before a pixel or cell is drawn. The comedy in a sense also lends itself to the physicality of the edit and animation style, going hand in hand. Great animation is equal parts concept and execution. Getting lithe animation is one element, but the design of characters and stylistically the tone and theme of a piece plays also an integral part. Sony Pictures’ Spider-Man: Into The Spider-Verse does this well. Surprisingly. And I say that because as far as animation, Sony Pictures has done well in creating great looking content with the likes of biohazard. But stylistically, the more indie, non-traditional concepts was never something I would think Sony would be easily sold on. The acid colours. the Ben Day comic-like dots and textures. Dipping in and out of the comic book aesthetic with panels and caption text, which in turn added to the piece’s self-awareness and humour. This proved to be more adult than expected. The risk that comes with being that experimental is higher than creating the acceptable generic 3D animations that flood the cinemas every year. So the fact it was done, and so well, has to be commended. Whoever (singular or plural) pushed for it deserves a medal. The character design has to be commended too, and I say this after looking at Spider-Man PS4‘s Miles and Sony’s Miles, where the latter felt more thoughtfully composed. The look of King Pin was out there, understandably. The guy was literally a block. But I think the first set up of the monstrous scorpion made the introduction of the King Pin’s design more palatable. My favourite baddy however was Octavia. The reveal of her tentacles was an “awe yeah” moment for me, and her passion for her work and natural curiousity is something i wish to mirror in my own endeavours for 2019. Each second of Spider-Man: Into The Spider-Verse (which is a 117-minute movie) took an artist an entire week to complete. That is 4 years and 800 people in totality. And it shows. You can pick up on certain scenes where that extra few frames were added to create a movement that eliminated the rigidness and inorganic movements that plague 3D animations. Not to mention Miles facial expressions that are not visible on any generic expression face charts. Lovers of animation live for such moments. And there were of few of those great moments, particularly in action sequences; the escape from Dr. Octavia’s lab or Miles carrying an unconscious Peter B. Parker whilst being chased by police. Everything spoke to a well-oiled, thoughtful aesthetic which ultimately bolstered both the narrative and the humour of Spider-Man: Into The Spider-Verse. You can pick up on certain scenes where that extra few frames were added to create a movement that eliminated the rigidness and inorganic movements that plague 3D animations. Not to mention Miles facial expressions that are not visible on any generic expression face charts. Lovers of animation live for such moments. And there were of few of those great moments, particularly in action sequences; the escape from Dr. Octavia’s lab or Miles carrying an unconscious Peter B. Parker whilst being chased by police. Everything spoke to a well-oiled, thoughtful aesthetic which ultimately bolstered both the narrative and the humour of Spider-Man: Into The Spider-Verse. Comedy is great, but do not be fooled. Spider-Verse has some true, heartfelt moments. The emotive impetus varies depending on the scene, but the overall effect is the same. Miles needs to come into his own. And all his experiences, good and bad, are shaping him into the hero he naturally is. The ‘rocky’ relation between Miles and his dad (which really is an exaggeration on my part) holds in it the expectation a father puts on his son to excel, seeing his potential. This has however unwittingly turned Miles potential into a bit of an onus, and though they do not see eye-to-eye, the love is indubitably there. More interestingly is the relationship between Miles and his uncle Aaron. Anyone else felt like Aaron was a scene away from rolling up a fat one to share it with Miles? Anyway, when things get hectic, Miles seeks his Uncle Aaron apartment for refuge where they talk about school, girls and the whole yard. A place where Miles could detox from the stress of school life. So when Miles comes to Aaron’s apartment unannounced and finds Prowler is, in fact, his Uncle, King Pin’s goon who has spent his time in the film hunting and trying to off Miles’ in Spider-Man outfit, you can imagine the dismay to find his refuge is no longer a safe place. The estranged brotherly relationship between Miles’ Dad and Uncle Aaron also spoke volumes despite being mentioned in pretty much two scenes. And for a pious father to be worried about his son’s whereabouts to the point of breaking the non-communication with his brother by calling Aaron also speaks to a family dynamic rarely seen in an animation aimed at kids. It is sadly the death of his Uncle, in his arms albeit, that forces Miles’ origin story to align with that of the other Spider-Men. And all the while, as Miles Morales was still struggling to grasp the full breadth of his powers, doubt came from the other Spider-Men as to his ability to do the task needed to shut down the time-altering collider. And it was Spider-Noir who started the trend of testing Miles’ dexterity and readiness by executing a sneak attack. This sneak attack involved yelling ‘sneak attack’ swiftly followed by kick-sweeping Miles’ feet from under him then grabbing him by the chest before he falls. Miles’ always got caught out by this. So you can imagine my own elation when Peter B. Parker opted to stay behind in a suicide mission to dismantle the collider himself when Miles kick sweeps him and holds him by the chest over the space-time rip that would return him to his own universe. The shot was a short one, but Miles Morales posture was godly. His nuts were most certainly dragging at this point. It was a definitive moment that proved Miles Morales was coming into his own as Spider-Man. Tight fit. And we’re not talking about the spandex. If there was ever a worry that I had in the back of my mind come the second/third trailer for Spider-Man: Into The Spider-Verse, it was this one thing – the plethora of Spider-Men. One could easily imagine how this many characters could lead to a competition for narrative space, ultimately fracturing the experience. Avengers had this issue, but the characters at least had stark differences. But a bunch of Spider-Men may work against cementing Miles as the Spider-Man of this film. I’m happy to say the presence of characters was well-balanced and was not as intrusive to the narrative. And though Miles Morales origin is forever connected to these characters, it still penutimately feels like a Morales-run effort. Gwen Stacy stylin’ on them, even with the gap. My favourite off the rip is certainly Gwen. And thanks to Miles’ mishap she had a funky hair-do to match her eccentricity. Furthermore, judging from the little interaction betwixt the two we definitely see something blossoming in the love department. However, we have to say we were glad it was never a central theme for Spider-Man: Into The Spider-Verse. Spider-Ham, Spider-Noir, Peni Parker aka SP//dr all had their moments and played great support. Importantly, their moments were not overly bearing on the narrative as a whole. But we understand why the introduction of the Spider-Men was integral for Spider-Verse. One, vying for the possibility of spin-offs and sequels. Obviously. Another reason, however, is for the narrative to be able to connect and intravenously give Miles Morales the renowned stature held by the man behind the original mask. That is for the audience who do not have knowledge of Miles Morales from Marvel Comics to begin with. In saying that, I loved the Stan Lee cameo. Apart from it being the month of his birth and there being only a handful of film cameos out there left for fans to see. In Spider-Verse he voiced the same sentiment about Spider-Man he had in real life. The same point made in Mary Jane’s touching tribute to the death of Peter Parker in the animation in front of a crowd of masked supporters. The great thing about Spider-Man is anyone can wear the mask. It is the ideals he (or she) stood for is what made Spider-Man a hero. And in a time like we are living in now, seeing Miles fluently speak Spanish with his mom and go toe-and-toe with his pops with love, contradicting many a stereotype, is something that made me smile away from the narrative as a whole. Spider-Man: Into The Spider-Verse is the true launching pad film for Sony’s Spider-Man/Marvel universe. Which makes Venom a “successful” box office test run that no one is rushing to see again anytime soon. Spider-Verse was the more successful film in the narrative and aesthetic department. It embodied both the spirit of innovation and style. No debate. My only hope is that Sony Pictures does not cloud their vision with instant box office earnings and merch (is that Marvel’s slice?) and force a sequel that is out-of-pocket. Or force-firing the ones that heralded the experimental direction of the first animation for a bunch of yes-men and trend-hoppers. In less than a month, Spider-Man: Into The Spider-Verse has domestically made $85,328,730 and $64,324,853 internationally (as of December 29th 2018). And with a budget of $90 million, Spider-Verse most certainly was worth the creative risk. I personally am looking forward to spin-offs and sequels. Spider-Verse was fun. The Spidey we love has always been that. But Spider-Verse also has a lot of heart. And with the likes of Stan Lee gone, it’s great to see the legacy of Spider-Man take on a new, but more importantly, an endearing form. And that post-credit scene of Spider-Man 2099 travelling back in time to where it all started, time-warping into Marvel’s classic 60’s Spider-Man animated series. Seeing both Spidey’s bewilderingly and angrily pointing at each other – memetastic gold! But how did you guys rate the animation? Is Mile Morales here to stay? Tell us in the comments!